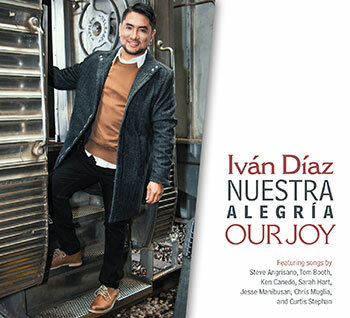 Iván Díaz, a prominent figure in bilingual worship, masterfully provides new versions of songs with which multicultural assemblies will quickly become familiar. As Catholic communities in the U.S. evolve and incorporate the Spanish language into their bilingual services (or add new Spanish Masses), the music that serves the Church will evolve too. Iván teamed up with well-known Catholic contemporary composers to create bilingual versions of songs that are popular among English communities. Alongside, Fr. Juan Sosa, they carefully developed all-Spanish lyrics to songs that were previously only available in English. And in some cases, they translated Spanish songs and hymns into English. Iván’s goal was to build a bridge that would unite bilingual communities as they worship together in liturgy. Through collaborations, faith and musical experience, Iván’s new collection is helping to build this bridge. Curtis Stephan, Chris Muglia, Ken Canedo and Anna Betancourt are also part of this multiple-formats collection — a bilingual MP3 Album, a Spanish-only MP3 Album, a CD with bilingual songs, a guitar songbook and an eBook. Now, the familiar songs in Nuestra Alegría/Our Joy, with melodies that choir directors, musicians and community members already know, can easily be learned in a new language and incorporated into multicultural liturgy.